I've already talked a lot about this book: first, when Aaron and I heard Kate DiCamillo speak last September and she signed our copy of this book; and then again a few weeks ago when it surprisingly won the Newbery. My thoughts have run the gamut with this book and have become all mixed up as I have considered my own thoughts, my children's response, and whether or not I think it deserved the Newbery. When I first heard about the Newbery, I was thrilled (and I said so right here), but the more I have thought about it, the more I wonder if my feelings of elation were more related to how much I love Kate DiCamillo and less about how much I loved this book. This isn't to say I didn't like the book. I did. In fact, there are scenes and sentences that I could read again and again and never get tired of because of the sheer wittiness and hilarity of them. But I also think my original gushing has subsided a little bit, and overall, I am not quite as enchanted. But before I get into that any further, let me tell you about Flora . . .
Flora ends up reviving the squirrel by using a modified version of rescue breathing and CPR. It soon becomes obvious that she has saved no ordinary squirrel: he is incredibly strong, he types, he composes poetry, and he flies. (And his name is Ulysses.) 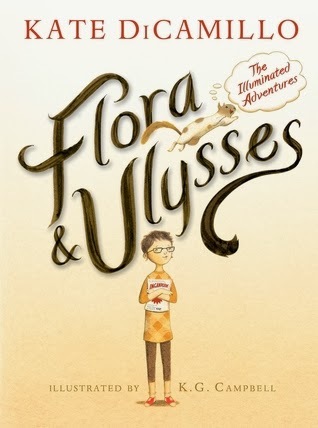 But Flora's mother has no interest in her daughter keeping a super squirrel, and she becomes bent on getting rid of Ulysses by any number of foul means. This forces Flora to label her mother as "the arch nemesis." Before long, a hilarious cast of characters are involved (temporarily blind William Spiver, Mr. Claus (a psychotic cat), a much-beloved shepherdess lamp named Mary Ann, Flora's shy and socially awkward father, trusty neighbor Tootie, and slightly senile Dr. Meescham). And right at the center of everything are Flora and Ulysses. My opinion of this book is far from objective. Since I read it aloud to my five-year-old and almost four-year-old, I looked at everything from their perspective. And this is what I saw: the beginning and ending were funny, exciting, and engaging. They begged for me to read more. They wanted to see what happened next. But they lost interest in the middle portion of the book. In fact, there were nights when Maxwell chose to go to bed and I just read to Aaron by himself. Since it won the Newbery during the time we were reading it, I think I became more critical while reading the last seventy pages. One of the main concerns critics raised about the eligibility of the book was the comic-strip illustrations throughout. Some thought the plot of the book was carried forward by the illustrations and that the story couldn't stand on its own without them. I didn't find this to be the case. The story always seemed to make perfect sense if I read the last sentence of the previous chapter, skipped over the comic strip, and read the first sentence of the next chapter.
. . . That is, it seemed to work until the very last one. In the sentences preceding the comic strip, Flora hears her mother scream and thinks she is worried about her precious shepherdess lamp. Then in the comic strip, Flora's mother says, "Please, George. Tell me that Flora is here!" which makes us (and Flora) realize that Flora is actually much more important to her mother than a silly old lamp. When the text picks back up, Flora is shocked by what her mother has revealed. But the whole thing makes absolutely no sense without the pictures in the middle. However, there is text included along with the pictures, so maybe a case could be made that it still works without the illustrations as long as you can consider the included text. I'd be interested to check out the audio and see how it handles the illustrated sections. When I try to determine how I personally felt about the book (without considering my children's response or the Newbery criteria), I have to admit that I liked quite a lot of it. "It was certainly possible that Mrs. Tickham had a brain tumor. Flora knew from reading TERRIBLE THINGS CAN HAPPEN TO YOU! that a surprising number of people were walking around with tumors in their brains and didn't even know it. That was the thing about tragedy. It was just sitting there, keeping you company, waiting. And you had absolutely no idea. This was the kind of helpful information you could get from the comics if you paid attention." Was Flora strange? [Ulysses] supposed so. But what was wrong with that? She was strange in a good way. She was strange in a lovable way. Her heart was so big. It was capacious. Just like George Buckman's heart. Do not hope, Flora thought. But she couldn't help it. She did hope. She was hoping. She had been hoping all along. So while it's not my absolute favorite book by Kate DiCamillo (it would be very difficult to knock Edward Tulane down from his pedestal), I liked it very much. And really, my kids liked it, too. The ending was so well-executed, so triumphant, so exciting, they couldn't help but bounce up and down on the bed. And I had to laugh when we read this line about Ulysses, "And maybe there would be a poem about a horsehair sofa. And one about a vacuum cleaner," and Aaron exclaimed, "What?! He remembers the vacuum cleaner?!" And Max replied in a very matter of fact way: "Of course he remembers it. He's a super hero. He's like me."